These programs are purposefully constructed to provide the students with a variety of academic and non-academic experiences promoting their cognitive, social, emotional and physical abilities. They enhance their morning experience of a core curriculum while encouraging further development of their problem-solving and critical thinking skills. Most of all, the children will have tremendous fun while learning! Phonics Fun I – (11:30-2:00) Come join us and let your child learn phonics the fun way! Our program emphasizes the relationship between letters and sounds through books, games, crafts and songs. Children work both individually and as a group as we creatively put phonics into play! Art in the Afternoon (3-5) – (11:30-2:00) This is a program for children who love art. We will be painting, drawing and working with clay, as well as other mixed media. As we create our own art, we will explore and discuss the work of some famous artists. Some projects will focus more on the process rather than the finished piece, but either way, it will be fun for all! Window to our World (4s and TK) – (Mon & Tues 11:30-2:30) Students will delight in making their own ‘passport’ each September in order to spend the year ‘travelling’ to different countries around the world, immersing themselves in the culture, geography, food, and special landmarks unique to each destination. 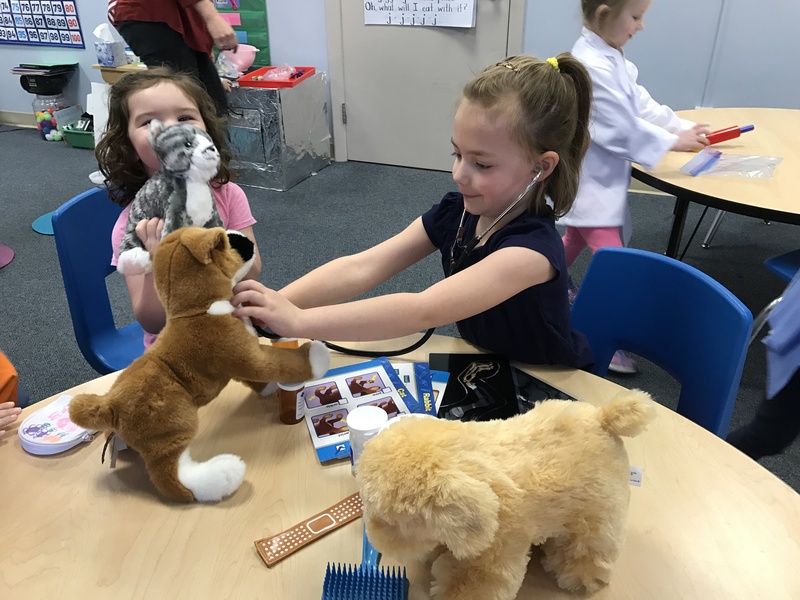 The explorers will be offered a fun and engaging range of activities to promote developmental growth in the areas of science, reading, language arts, writing, art and math. The geography component of the program will expose the children to different people and places while encouraging an appreciation of the world and its diversity. Throughout the year the students will create a keepsake journal to remind them of the interesting and exciting places they visited, and the wonders of each one. Phonics Fun II – Handwriting – (11:30-2:00) This class is a continuation of Monday Phonics Fun I focusing on the writing aspect of phonics. Children will use a multi-sensory approach to further develop their hand strength, pencil grip and letter formation. They will review the sounds from Monday’s class, learn sight words and word families, use manipulatives and games to reinforce concepts. The students will also express thoughts through pictures and writing in journals. It’s a fun approach to teach a lifelong skill! Science (3s) – (11:30-2:00) Join us as we explore the wonders of science. Your junior scientists will question, hypothesize, observe and test as they investigate the natural world around them. 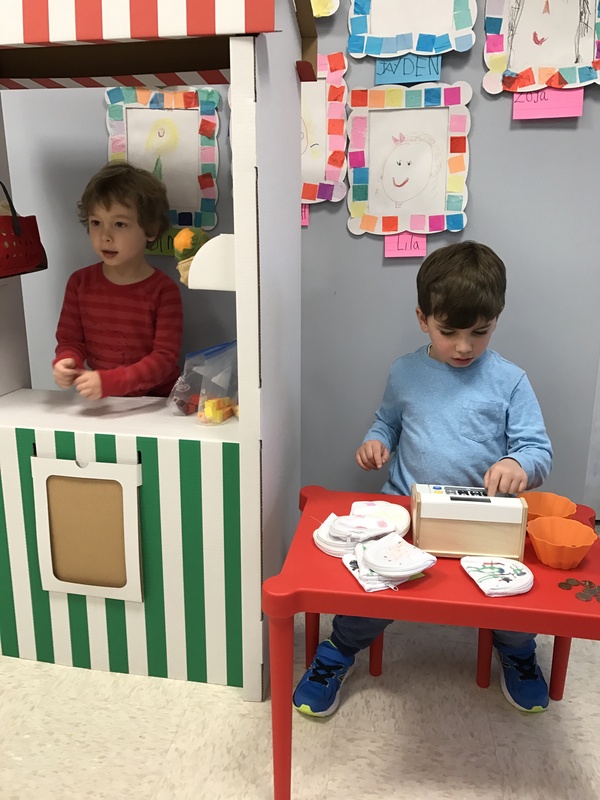 By studying magnets, water, states of matter, life cycles and more, children will explore how objects relate to their everyday life and begin to develop scientific habits of mind. Beginner Book Club (3-5) – (11:30-2:00) Let’s spark your child’s lifelong interest in reading! Each month we will spotlight a different children’s author. We will examine the characters in each book; make comparisons between the texts, and form connections across the curriculum with activities in Science, Math, Social Studies, Art and more! Some of the authors we will focus on are: Mem Fox, William Steig, Tomie dePaola, Cynthia Rylant and Rosemary Wells. Magical Math (3-5) – (11:30-2:00) How do we make math come alive? We will explore numbers, patterns, shapes, charts, graphs and more! The children will explore math concepts through play, hands on activities and a math inspired craft. Hands on activities will reinforce our exploration and most importantly, make math FUN! Music & Movement (3-5) – (11:30-2:00) Preschoolers love to sing and move! Music plus movement is a powerful learning facilitator. Weekly themes will keep the learning fun, and the interest running high! Each unit will have developmentally appropriate activities with a stimulating new theme to keep the children engaged and excited! This program will inspire a love for music and movement by providing creative opportunities for the students to express themselves in singing, instruments and movement. 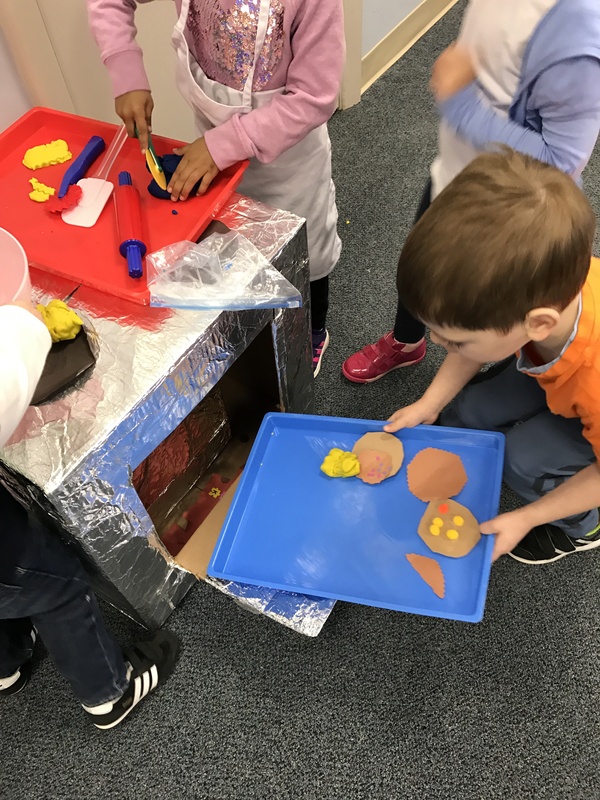 STEM for Preschool (TK and 4s if room) – (11:30-2:30) This program builds on child’s natural curiosity in the world around them by developing their STEM (science, technology, engineering and math) skills through exploration and play. The real-life skills that develop when learning STEM help make us better learners and problem-solvers. This hands-on program will encourage children to ask questions, solve problems and explore how things work. Explore The Arts (3-5) – (11:30-2:30) Join us for a unique adventure combining fabulous art projects and musical theatre. The year will be divided into four 8-week sessions. Each session will provide the inspiration for an art exhibit and musical production with live guitar. We will sing, move, create, play and put on four amazing shows! It is sure to be fun for all! Science for 4s – (11:30-2:00) Join us as we explore the wonders of science. Your junior scientists will question, hypothesize, observe and test as they investigate the natural world around them. 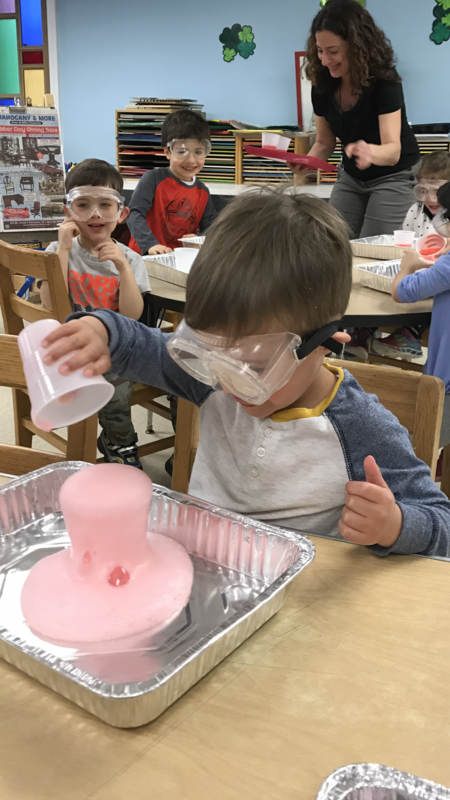 By studying magnets, water, states of matter, life cycles and more, children will explore how objects relate to their everyday life and begin to develop scientific habits of mind. Phonics for 3s – (11:30-2:00) Come join us and let your child learn phonics the fun way! Our program emphasizes the relationship between letters and sounds through books, games, crafts and songs. Children work both individually and as a group as we creatively put phonics into play!